If you arrive from St Etienne les Orgues, drive straight through Cruis past the tabac, the Bar des Alpes and the school on the left and the parking lot on the right. As you leave the village continue right on the main road (D951). Do not take the other road on the left. After less than 3 km you will see an ochre house on the left and some garbage bins on the right. Turn left and take the dirt road up the hill. Continue past a larger stone house on the left and head straight up the steep lane. Drive slowly over the asphalt bump and the first hundred metres or so, which are a little rough. We are working on improving it but every rainstorm sets us back. If you take the road from Forcalquier to Sigonce, continue on to Montlaux but don’t enter the hamlet. Stay on the main road that turns right and then take the first road on your right through lavender fields and several farms. The road is narrow so drive slowly up over a few little bridges until you come to the main road and the ochre house on the left. Go straight across the main road and take the dirt road up. Then follow the directions above in bold. 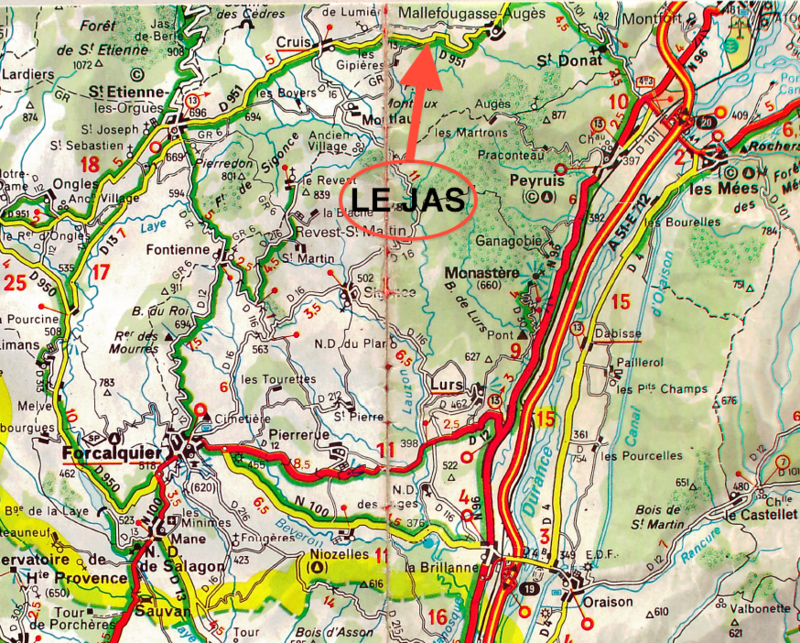 If you arrive from the north on the A51, take Exit 22 just after Sisteron and then the Route de Marseille (D4085) south for a few kilometres to the roundabout of a shopping centre where you exit at 3 pm on the D951, which will bring you up and then down into Mallefougasse-Augès. If you arrive from the south on the A51, take Exit 20 and follow the signs through two roundabouts to Mallefougasse. 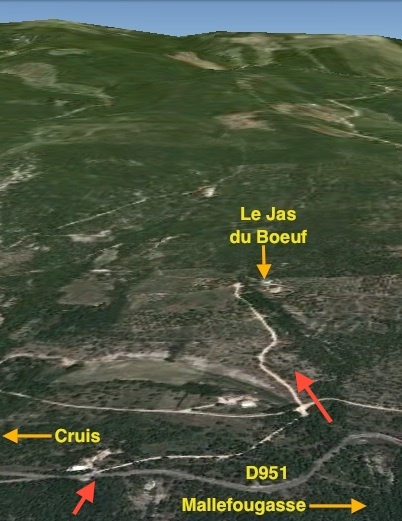 Carefully cross the N96 with the olive oil store on the right and take the D101 up past the Chapelle St Donat. 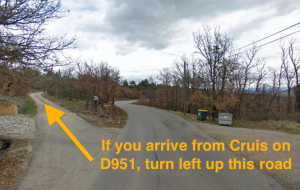 Stay to the left up this newly paved road until you get to the D951, where you turn left. 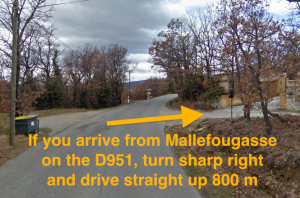 Just after leaving Mallefougasse (marked by a sign on the left with a diagonal line through it), drive slowly through a hair-pin turn and just after two more (single-lane) hairpin turns you will see a small paved road and some recycling bins on the left and a house on the right. Make a sharp right turn up the unpaved road then follow the directions above in bold. WARNING! Some GPS systems ignore our little dirt road and take you into Cruis and then back out along the old dirt road. If you’re arriving at Marseille’s Marignane airport it takes about 75 minutes to follow the A51 around Aix-en-Provence and take Exit 20. You can also take a bus to Les Mées, where we will come and pick you up for €20 if you let us know ahead of time. If you’re arriving by TGV and will rent a car, get off at Avignon (2hrs) or Aix-en-Provence (1 hr), two cities worth spending time in. If you do not want to rent a car, get off in Marseille and take the train to Sisteron, where we will pick you up for €20 if you let us know ahead of time.